After an exhaustive search for just the right cruise for our family vacation, we settled on a small cruise ship (450 passengers) that went to Eastern Caribbean ports that enticed us; provided enough variety for dining, entertainment, and activities; and included everything from great accommodations, all drinks, and specialty dining to round-trip airfare, transfers, shore excursions, and tips. It wasn’t cheap, but it wasn’t much more than if we had chosen a better known cruise line offering cheap rates and then charging for every extra and footing the bill for our flight. Can you guess which ship we picked? 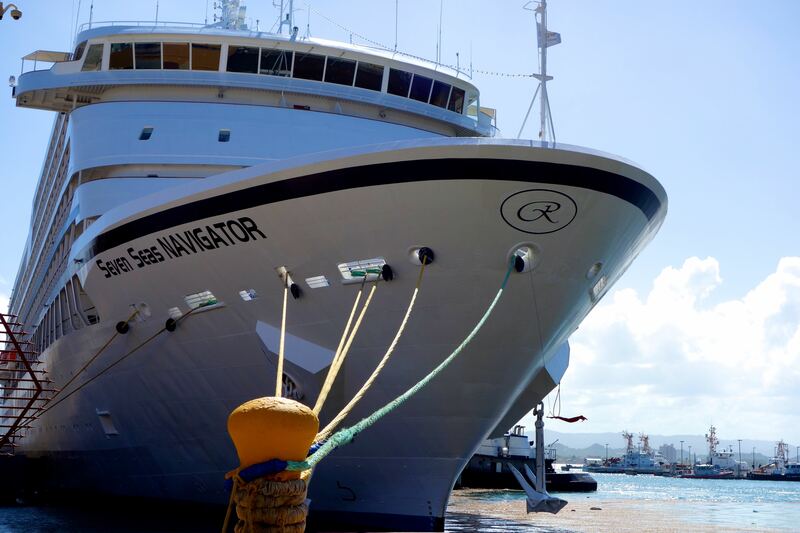 The Regent Seven Seas Navigator: our floating home for 12 days in the Eastern Caribbean. If you guessed the Regent Seven Seas Navigator, you sure know your cruise lines. Interestingly, we had never heard of them until we exhausted all other options. How they’ve stayed so under the radar is surprising, but as we found out for ourselves, people who know this cruise line really love it. 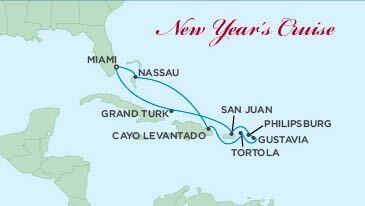 Our eastern Caribbean cruise itinerary (photo-graphic: Regent Seven Seas Cruises). Our 12-day itinerary was slated to look something like this: Board in Miami; day at sea; Grand Turk, Turks & Caicos; San Juan, Puerto Rico; Philippsburg, St. Maarten; day at sea; Gustavia, St. Barts; Tortola, British Virgin Islands; Cayo Levantado, Dominican Republic; day at sea; Nassau, Bahamas; Miami. But as any good traveler knows, plans don’t always go as planned. Still, our ship was a beauty and was a perfect floating abode. She was small enough to get to know the layout and our fellow passengers really well, and large enough to have a slew of activities to choose from when cruising from one tropical port to the next, or–as ended up happening more than once–readjusting our course when we couldn’t go to the scheduled port (more on that in upcoming posts). Traditionalists favored soaking up the sun on the pool deck, indulgers decompressed at the spa, partiers danced the night away, risk-takers hunkered down in the casino, fitness buffs hit the gym, the studious read in the library, and everyone made their way at least once to the theater to take in show. 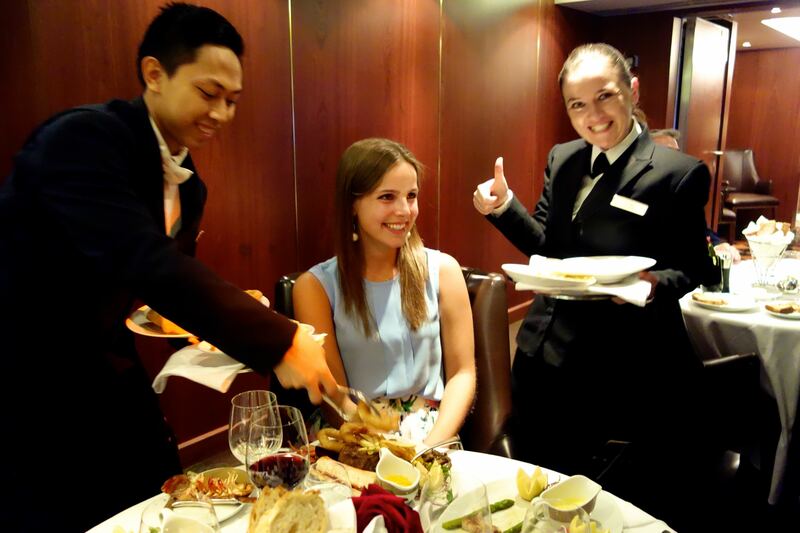 Jackie, our resident foodie, delights in all the wonderful food Marja and her colleagues suggest to us. The crew was a delight and hailed from all corners of the world. They were a veritable United Nations of the Seas, embodying the ethics of hard work, attention to detail, and genuine kindness. Every morning in our hallway, Fatima and Puri, who tended to our room, greeted us with smiles, as did their jovial colleagues throughout the ship. Our favorite wait-staff–Doni, Alvin, Guiliano, and Marja–came to know our food preferences so well, they practically knew what we’d order even before we did. A really fun event was “hallway open house” when we got to socialize over wine and appetizers with our fellow hallmates and some of the crew. Getting to know some of our crew over dinner was a real honor and learning experience for us. 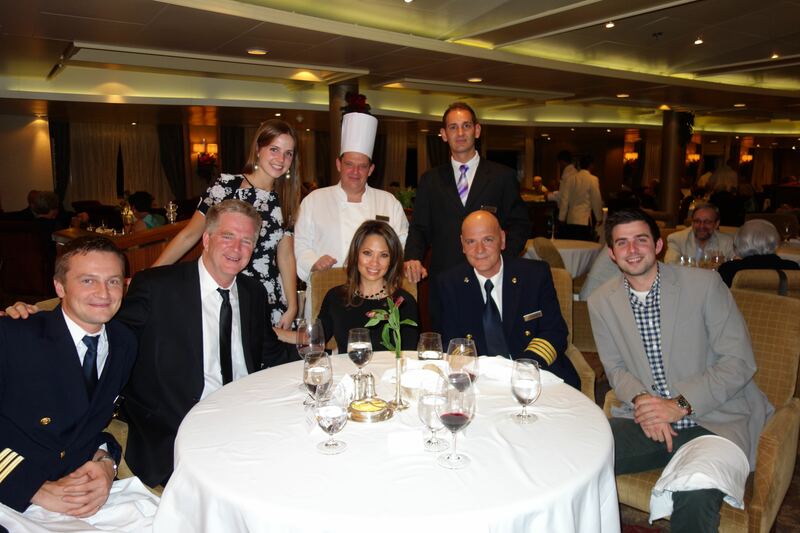 Given Rick’s work as a travel writer and travel show host, we were afforded the opportunity to dine with the Staff Captain as well as with the General Manger, who generously shared stories about life and work on the ship. And at the end of each thrilling day on land or any time we needed to wind down, our bartending sensei “Elvis” (we still aren’t sure if that’s his real name) would patiently and gleefully teach us all about exquisite liquors and fruity libations we had always heard of but never tried. 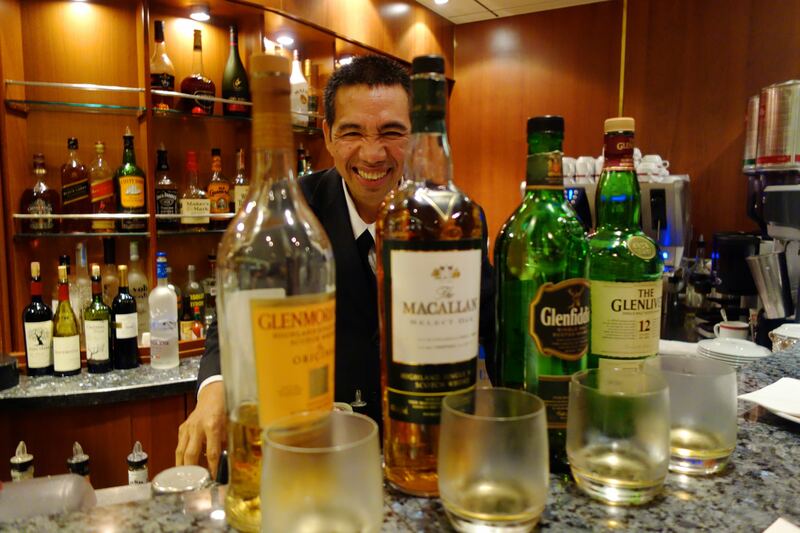 Our bartending sensei “Elvis” teaches us all about the best whiskey. Thumbs-up for our shore excursion staff! 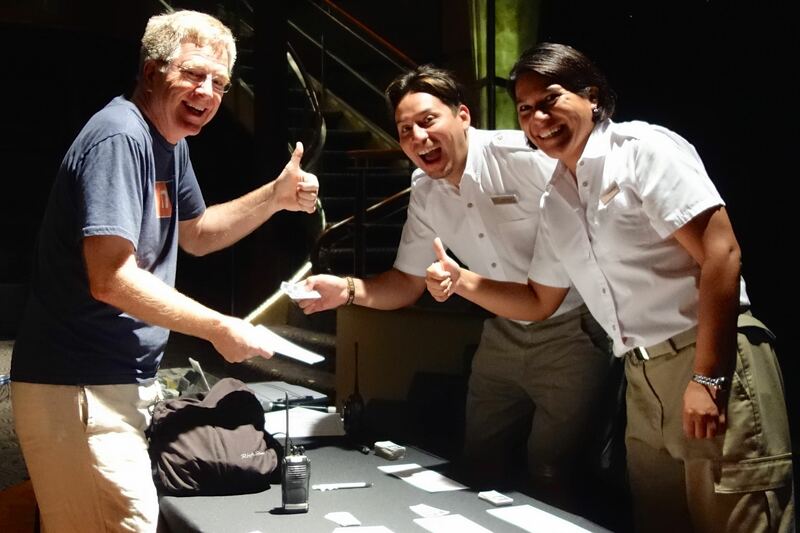 Our shore excursions organizers became familiar cheery faces as they greeted us in the ship theater each morning we arrived at a new port. Organizing 450 people’s free time can be daunting, but they handled it like pros and bent over backwards to make sure everyone had the experience they were hoping for. 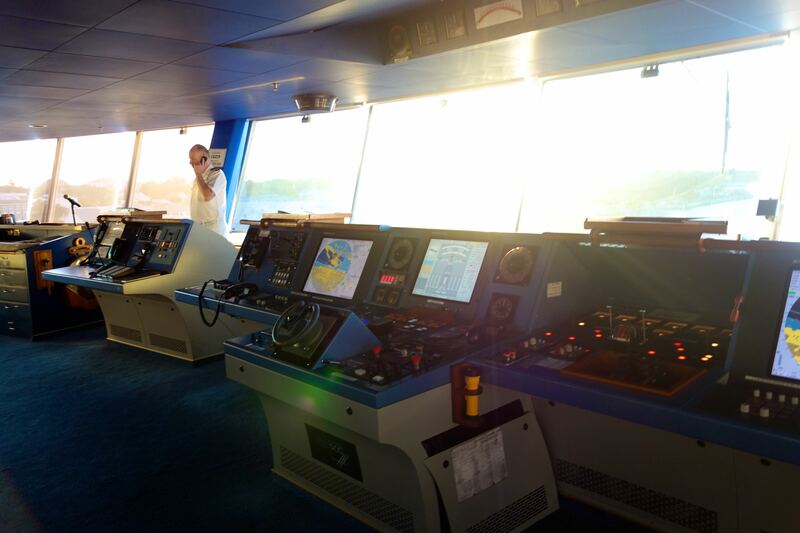 Seeing our impressive bridge and getting to chat with the bridge crew gave us a better appreciation for how much they care for our safety on this ship. 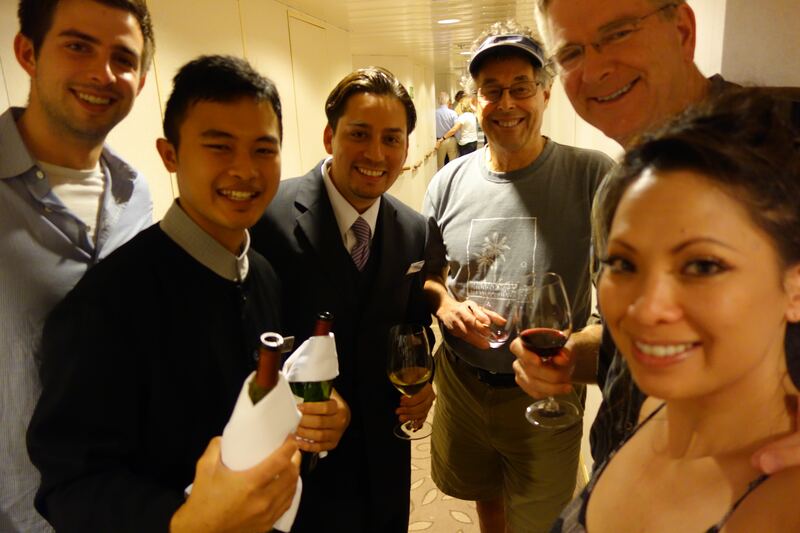 One of the major highlights on the ship was when Rick, Andy, Jackie, and I got a behind the scenes tour of the ship. It’s a wonder how anyone could navigate the labyrinth of these typically “Crew Only” areas (I have enough trouble figuring out which way is port, starboard, bow, or aft when I’m out on an open deck). We serpentined through the loud and fresh-scented laundry room, the lively and unceremonious crew rec area, the kempt officers quarters, the ship’s massive and bustling main kitchen, and most impressively, the ship’s stately bridge. Besides the constant thought of “whoa!” that ricocheted in my mind with every new thing we saw, I kept thinking that it’s impressive how many people it takes to run a ship properly. Every crewmember on the Navigator did their utmost to keep every passenger safe, healthy, entertained, relaxed, informed, fed, quenched, fit, pampered, cleanly, and happy. And they did a stellar job of it. When it comes to cruising, it’s not just about where you go but how you get there. It took lots of work to find the right cruise itinerary and cruise line for our family, and we’re confident we picked the perfect ship for us. To find out about all the exciting, tropical destinations our ship and crew took us to, stay tuned for upcoming posts. Ha! That was totally my guess that you had picked Regents. Once you’ve done a Regents cruise it’s hard to do anything else. My only complaint was that we were inundated with brochures from them when we got home and it was difficult to get off their mailing list. I’m impressed, Jennifer! It surprises me that more people don’t talk about them. They’re really a great organization. As for the brochures, We’ve only been bombarded with emails, not hard copies, so it’s tolerable. I cruise a lot, but I must say that I don’t know much about this cruise line, either! 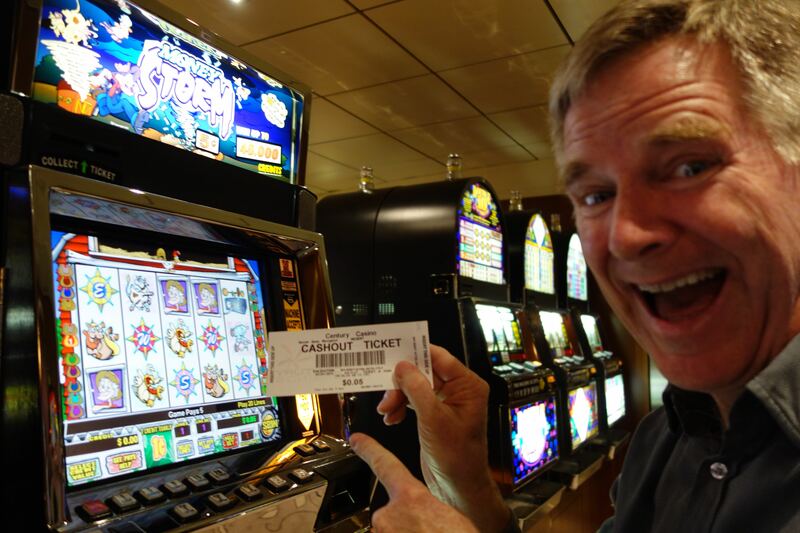 The staff in the cruise do make a huge difference. Time and time again, it’s always the staff (and FOOD) that win us over. Glad that you had a whale of a great time! Definitely true about the staff. The food on the Navigator was stellar, but when we were in the Mediterranean on other cruise lines, food wasn’t so critical. For us, it was more important to stay in port longer and eat locally. That said, when the cruise ship food is good, you notice. When it’s bad, you really notice.